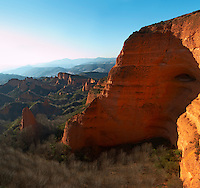 Las Medulas Roman gold mine, el Bierzo, Castilla y Leon, Spain, stock photography samples, by Per Karlsson, BKWine. Las Medulas is an incredible man-made landscape in northern Spain in Castilla y Leon (Castile and Leon). This is how Wikipedia describes it: "Las Médulas is a historical site near the town of Ponferrada in the region of El Bierzo (province of León, Castile and León, Spain), which used to be the most important gold mine in the Roman Empire. Las Médulas Cultural Landscape is listed by the UNESCO as one of the World Heritage Sites. The spectacular landscape of Las Médulas resulted from the Ruina Montium, a Roman mining technique described by Pliny the Elder in 77 AD consisted of undermining the mountain with large quantities of water supplied by at least seven long aqueducts tapping the rivers in the nearby mountains. The same aqueducts were used to wash the extensive gold deposits, a precursor of Californian hydraulic mining. The area Hispania Tarraconensis had been invaded in 25 BC by the emperor Augustus, so the mining was initiated some time after the region had been subdued."